Dynamic Edge (DynEdge) is an IT consultancy based in London and Nottinghamshire. We specialise in Ruby on Rails but pride ourselves in being adaptable and capable of working in whichever system best suits the project. We take an agile approach, aiming to give customers their first draft of a system in a matter of days not weeks or months, iterating through the design and involving the customer to create a more engaging experience. This is the personal blog of Steve Smith. Dynamic Edge Founder and will contain everything from Ruby on Rails and general programming to random rants. Does your app need Incoming email? Want to receive email in your web application? 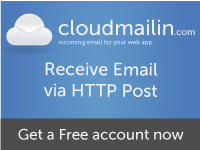 Sign up for CloudMailin and we’ll convert your emails to HTTP POSTS.